My mate Jocelyn is the perfumer at Cult of Scent. She is a fast talking, fun and passionate perfumer whose work is definitely Indie and really, really good. She was lauded by no less than Luca Turin in 2015 and we have written about others in the range here on APJ before. Here are links to those: Fire Amber Baby, Sweet Libertine, Something Beautiful and Hedonist. From Jocelyn (edited): Just a heads-up folks. I am discontinuing Karavanserai. There is about 200mL left, then that’s it. I love it, but the Angelica root & Cedrat oils are hard to get good reliable stocks of, so it’s time to let it go. If you’ve been wanting to buy this dry herbaceous citrus cologne, now is your chance. To sweeten the deal, I am extending the DISCOUNT CODE APJ10 till the end of this month. So, how does Karavanserai smell? Imagine a cologne fragrance based around rose. I know, it’s simple but revolutionary. Well, it’s not merely rose. It’s mainly citrus with a lovely slightly salted dry grass that last and lasts. The rose seems to be more about the rosewood and sharp green rose flower than the usual fruity or honeyed variations of the theme. Karavanserai is not a bit what I’d expect from something of that name. In my mind I expect a spicy frankincense blend full of hot wind and dry, straggly shrubbery. Maybe some camel or goat and the smell of horses and their tack. Interestingly the Persian word means the inn or stop where travellers could rest and recover from the day’s journey, not the caravan itself. Lasting power is excellent with the first hour having big sillage that softens off considerably for the rest of the ride. By 5 hours I can still smell the remnants and they still have a woody citrus wash about them. Very, very nice. Nevertheless it is gorgeous and I’ve used quite a lot of my 8ml from my VAGABONDS CHOICE Travel Set. Don’t forget the DISCOUNT CODE: APJ10 it works on the whole site till the end of January. What would you expect to be the notes for something called Karavanserai? One of the most gorgeous things about living in Sydney is the frag culture. We are not a huge section but we are all quite friendly and try to get together sometimes to sniff and laugh. Have you noticed that most perfume people are fun & gregarious and also it feels like most of us have known hard times but prefer to rise above them with humour & scent? I also love that we can do our connecting over the internet with the whole world at different times, perfect for anyone with sleep problems, new pets or young children. No one can judge your track suit or lack of clothing when you’re online at midnight in your time zone catching a breather from whatever has you up. Thick, toffee, animal, vanilla, warmth like smoky fireside, fatty, deep, smooth, scratchy dry heat, beeswax, tree sap sweet like maple syrup. Wearing Fire Amber Baby on a warm spring evening and it is blossoming like something from another era, another mindset, another culture. If thick, rich and luscious amber fragrances get your heart pounding then this will send you into fibrillation. 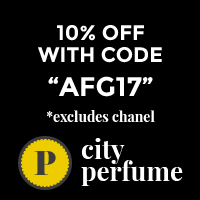 A raw and sensual fragrance that is so different from the multitude of ambers I know & love. Crunchy and crackling like honeycomb doped into patchouli toffee and rolled in the vegetal animal grown of labdanum. If you’ve ever looked through an amber brooch, one of the larger ones with bubbles and imperfections through it, at the sun then you may just know what the smell of Fire Amber Baby smells like. At once commanding and comforting the sheer range of nuance that I am noticing tonight in the warmth that I’ve never noticed wearing it in the cool. Yes, it’s still big and intricate in the cool but heat seems to make it jump and sparkle brilliantly. A statement fragrance if ever there was one. Confidence and comfort radiate, maybe you would need to spritz the air and walk through the mist if wearing to work. Perfect for galleries, outdoors, club life and romance, though I would definitely wait an hour before going to dinner or a movie. It has real red dress, red carpet chutzpah. What is your amber fragrance? A huge thank you to Jocelyn Fullerton of Cult of Scent for her generosity. Great response from you guys and really excited to get to the winners. The winners will have till Wednesday 6th July 2016 to get in touch (portia underscore turbo at yahoo dot com dot au) with their address or the prize will go to someone else. As you may know I really love the Independent Perfumers. Though I know they are not the right fit for everybody what really appeals to me about their work is the immediacy, the raw, fun, often outrageous ways they take their fragrances. Many of them use a high percentage of the commonly known as natural ingredients which can mean more distinction on how it will wear for you personally. They are also far less bound by market forces, regulation and fashion. No matter how talented a perfumer for the big boys may be they will almost always be working to a brief, that’s not the way to foster creativity and I imagine that many of their lives are far less fun and glamorous than we dream. Today I’m wearing a fragrance made by one of my mates, Jocelyn, whose fragrances I find extremely enjoyable to wear. Come for the journey with me. I won’t put the notes up because you’ll need them to enter the GIVEAWAY below. Sweet Libertine reads like an intensely animal floral on my skin. It’s a warm, lyrical extravaganza that pulses off my skin in warm auburn hues and creates a fiery warmth in my heart. It purrs beautifully, resinous and elegant, for a couple of hours before the woods take over and more resins that linger and fade over another couple of hours. There is something very Australian Outback within its sensual coils and it reminds me of the summer mornings spent down in Temora on my Aunty Faye and Uncle Jim’s farm. The house was clean, spotless, and the table waxed. The red earth and eucalyptus were heating up, chickens scratching around the front yard, dogs at the back door and the sheep were baa-ing. Fresh flowers on the breakfast table, sometimes it was jasmine or wisteria, others it was freesias, zinnias, geraniums of everlasting daisies. The men would eat breakfast early and then be off about their days. Please go to Cult of Scent<< JUMP and find me a fragrance and an ingredient it contains. No Double Ups!! Entries Close Sunday 3rd July 2016 10pm Australian EST and winners will be announced in a separate post. The winner will have till Wednesday 6th July 2016 to get in touch (portia underscore turbo at yahoo dot com dot au) with their address or the prize will go to someone else. Do you have an area where you put your current high rotation fragrances? Mine is my desk. At any given time there may be 20 odd fragrance bottles scattered about it, a dozen or so samples and general perfume paraphernalia. It can get quite crowded so every couple of weeks I do a stocktake of what’s there and what will stay. This fortnight I’ve been pretty addicted to a couple of frags and they have seen a LOT of wear, the others are mostly seeing a few spritzes but a bunch will be going back in the cupboard. Some things go back in the cupboard after every use: Guerlain’s Shalimar and Mitsouko, CHANEL No 5 and YSL Opium. I have a few iterations of each and rarely know which one I’m going to feel like so it’s easier to have them all together in their cupboard space. Also, I will happily go looking for them particularly if the mood strikes so it’s good to have them accessible. So here’s the whole crew. A couple of them I also thought about selling so they have been on the desk and were saved from the chopper by my wearing and loving them again. What is staying till the next cleanup? The rest are back in their boxes and in the cupboard till I call them out again. What’s in your high rotation and where do you put them? Australia has some wonderful indie houses and perfumers. Recently one of the best loved among them, Jocelyn Fullarton, and I organised an afternoon at my place where she could showcase her wares and some of the ingredients that make up the Cult Of Scent beauties. It was a stellar afternoon, we had such a good time that I took only one photo. There was so much to smell and learn it was completely overwhelming. Great day. Jocelyn has some wonderful scents and I really like her enthusiasm, joy and sheer, unbridled passion for her work. It’s infectious and we were all fascinated. We got to smell a couple of new scents today but here are the current range. I find myself spritzing In The Woods the most from my Cult Of Scent Sample Set. It’s a modern Eau de Cologne interpretation and I find it soothing and elegant. 3-4 hours of excellent citrus into soft, lightly creamy woodsy dry down. Take your Travel Bottle with you for respritzes during the day and you’ll get the wonderful energising zing of neroli all over again. It’s a 100% winner for me. There will be reviews soon. As you can see we really covered some fragrant ground during the afternoon. Pieces of fragrance, vintage frags that contain those pieces, Cult Of Scent fragrances; we sampled the lot and it was totally fun. Cult Of Scent Sample Set 8ml per bottle! Jocelyn brought me a special Thank You gift. WOW! I am spoiled. Just found a bunch of shots that Scott took too. EXCELLENT!! Thanks Scotty. Go grab yourself a Cult Of Scent Sample Set. I promise you’ll be impressed. They’re excellent value. You get enough juice to really wear the fragrances and see how they fit in your life. Go on, you deserve something lovely! It’s also really important to support our local talent.